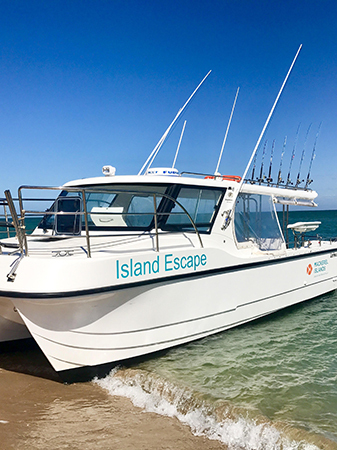 Experience a full day fishing charter for a taster of the magic of the Mackerel Islands, or a longer fishing trip getaway for a tick off your bucket list. With over 40 year’s experience fishing these waters we are the region’s experts. We’ll get you to the best fishing grounds in the Pilbara fast, in comfort and style. Put your fishing skills to the test, catch a beauty and claim bragging rights among your mates! 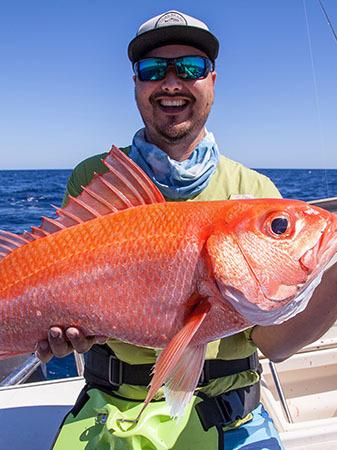 Full day fishing charters depart from Onslow, Western Australia or from Thevenard Island, Western Australia. Fishing trip getaways are available for 3 or 7 nights – don’t miss out on your chance to stay and fish the Mackerel Islands! New, custom built 11m twin hull LeisureCat, powered by 300hp Yamaha outboards, with marlin poles, toilet/shower, the latest electronics and an experienced skipper and guide. 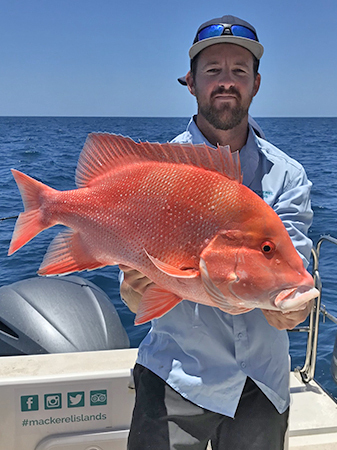 Fish a variety of styles to suit conditions – game fishing, sportfishing, bottom fishing, trolling, sight casting, lure flicking, stick baiting, GT popping, deep water jigging, snorkelling for crays. Our charters are renowned for Red Emperor, Rankin Cod, Gold Band, Coral Trout, Spanish Mackerel, Wahoo, Yellowfin Tuna, Amberjack, Jobfish, Pearl Perch, Giant Trevally, Queenfish, Ruby Snapper, Marlin, Sailfish, Mahi Mahi, Squid and Tropical Crayfish. One of our most popular packages. Two days of fishing action plus guaranteed chill time on the island. Home to the Pilbara’s fishiest waters, the Mackerel Islands are easy to get addicted to and you’ll know why once you reel in a thumper or two! You’ll leave relaxed, happy, and could even take home a feed of some of the best quality fish in Australia. Departs Onslow Tuesdays or Fridays. Partner stays free! Book the “own room” price & bring your partner for an extra $950 with the same inclusions as above. Not yet ready to leave? Additional nights $198 (own room) or $99 (twin share) – accommodation only. Additional full day fishing $350. The ultimate fishing trip, whether you’ve just got into fishing, fish every chance you can get, or are a hard-core fisho! The Mackerel Islands play host to an incredible range of species – and they are big! Go for glory, catch a personal best and feast on some seriously unbelievable seafood. These are the kind of fishing thrills you’ll remember for a lifetime. Partner stays free! Book the “own room” price & bring your partner for an extra $2,200 with the same inclusions as above. T&C’s apply. Minimum departure numbers apply. Fishing charters are maximum 6 lines (own or shared) & 10 people. Packages are subject to availability & not valid in conjunction with any other offer. Prices valid until 31/10/19. 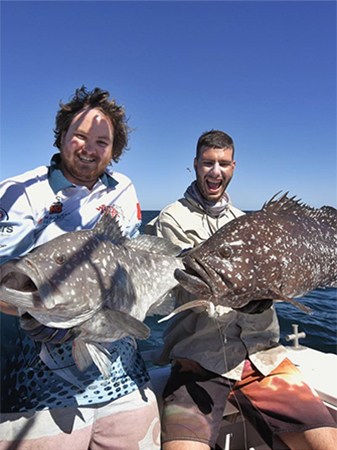 Mackerel Islands Fishing Charters are an iconic bucket list experience for any fishing enthusiast or visitor to the spectacular Pilbara region in Western Australia. Operating for almost 50 years, we know these pristine waters better than anyone and our experienced skipper takes pride in ensuring customers receive the benefit of our knowledge. 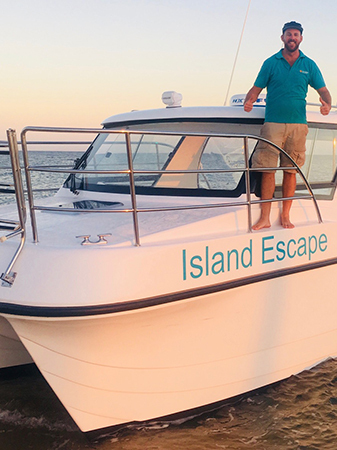 Our boat, Island Escape, is a brand new purpose built 11m twin hull LeisureCat powered by 300hp Yamaha outboards. It is the perfect vessel to fish the Mackerel Islands waters and we are very excited to have it available for charters from January 2018! Island Escape is fast (less time steaming, more time fishing! ), has a shallow draught (perfect for shallow reef casting and very stable in deeper sea) and is a very comfortable ride. Other important features include marlin poles for game fishing, toilet/shower and the latest electronics to assist our skipper put you onto the fish. We take up to 10 people out per trip giving you a personal and specialised fishing experience like you’ve never had before. Let us know if you have a certain preference (bottom fishing, trawling, sight casting) in advance and our skipper will try to accommodate it. We fish a maximum of 6 lines and offer both own line and shared line options. We may be able to accommodate additional observers in light wind conditions. 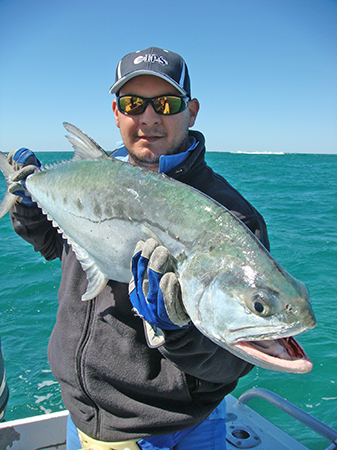 Our charters include lunch, tackle, bait and good quality Shimano overhead and spinning combo’s. We accept individual and group bookings and will tailor a charter to suit your needs. Minimum numbers do apply to depart. The sound of a reel being peeled off by a large Spaniard is something every keen angler should experience. 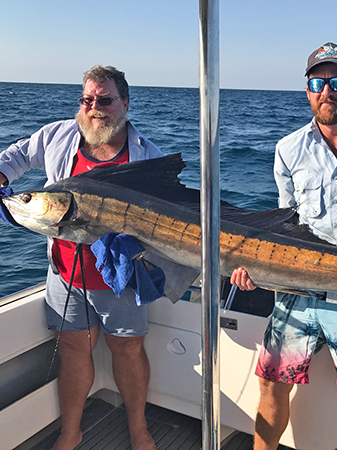 Using overhead reels and game rods, our skipper will trawl over proven ground mainly chasing Spanish mackerel, with catches of wahoo, cobia, tuna, sailfish and a variety of mackerel being common. Bottom fishing is an exciting way for everyone to have a line in the water waiting for that next big hit. Using Shimano overhead or spinning reels our skipper positions the vessel to drift strategically over known hot spots. Several spots are visited over the day to hunt out where fish are lurking. Lure flicking around the offshore reefs is undoubtedly one of the highlights of Mackerel Islands and has become famed among fishing circles. Monster giant trevally and queenfish gather earnestly here. 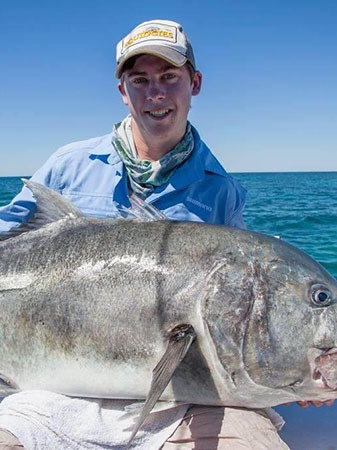 Flicking lures close to the rocks, in the white wash or over the reef, then watching a fish hit your lure in the crystal clear waters is an action packed way to fish that’s guaranteed to get any heart racing. Looking to bring your own boat over? Our facilities include car and boat trailer parking on the mainland, mooring hire, fuel, general store selling bait, ice, tackle and more. See our Boating Info page for details.